It is easy to mislabel Salman Khan's brand of humour. We have seen it so many times in the past. The actor once again is creating headlines for making a joke. Salman was promoting his song, Main Taare, from his upcoming production venture, Notebook, at a press conference. The film deals with the concept of falling in love without meeting. So, a journalist, rightly so, asked how that would work in the era of Tinder. As per reports, Salman jokingly replied, "Why only Tinder and not Grindr?" Props to the fact that, Salman, the epitome of cis hetero-machismo knows about a dating app specially designed for homosexual men and he doesn't mind saying the word 'Grindr' out loud. It is the 'Voldemort' of straight dudes. Well, then another journalist added one more app to the list - Bumble. The very app that has been recently launched in India by Priyanka Chopra. As per reports, Salman asked the crowd of journalists, "What is Bumble, who launched it?" After learning the answer to be his Mujhse Shaadi Karogi co-star, Salman said, "Why does Priyanka need Bumble?" Yes, the actor was referring to the fact that Priyanka is launching a female-friendly dating app despite being married to Nick Jonas. 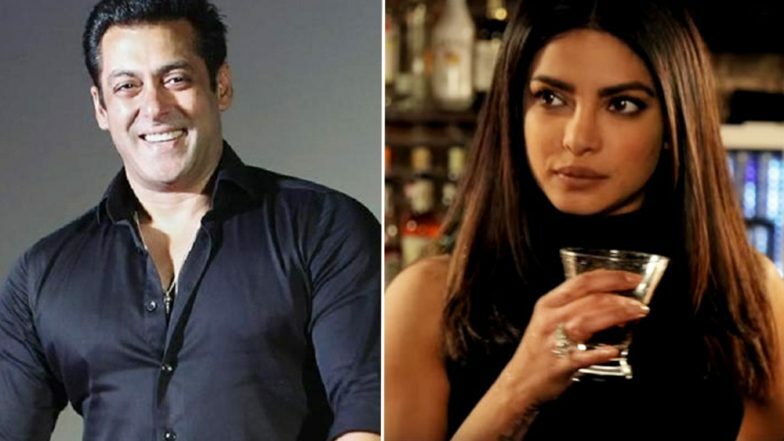 Salman and Priyanka were to team up for Ali Abbas Zafar's directorial, Bharat. Just a couple of weeks before the movie was supposed to go on floors, Priyanka pulled out of the project since she was getting married to Nick Jonas. There were several reports suggesting that Salman was not happy with this last minute call by the actress.